The centerpiece on my Christmas table often has to change for the actual Christmas Dinner. I have several requirements when setting it up. It must be low. Visiting is important and it happens across the table as well. An over-sized or too tall centerpiece interferes. I need to be able to duplicate it or something similar for multiple tables. We ofter have 15-20 people for Christmas Dinner and although I set it up as one long table, the centerpiece is duplicated at both ends. Affordable. This is always a plus at this time of year. Easy to set-up. Timelines are tight. 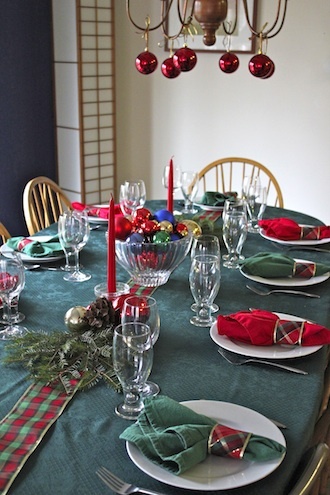 Here is the 2011 Christmas dinner table. I had 18 for dinner. My "company" dishes are plain white plates. I have 24 for large events. I have to use tablecloths because the second table is an ugly folding table. I went with deep green this year. 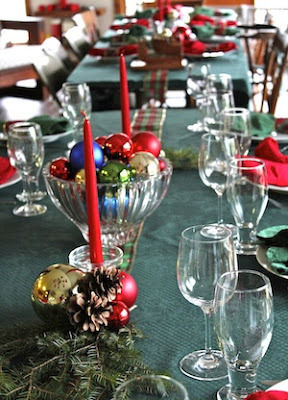 I purchased 6" wide plaid ribbon with a gold trim that ran down the middle of both tables as a unifying element. I used a smaller version to make quick napkin rings. I don't have 18 red napkins but do have 12 red and 12 green so I alternated and used the plaid napkin rings. In the center I used a crystal bowl of balls flanked by red candles in clear holders. I then laid a swag of fresh pine boughs. pine cones and more ornaments. Additionally, because Hanukkah and Christmas overlap this year, we added a Menorah and sang the traditional Jewish blessing. This happened after the photo shoot so it is missing here. It was a festive table but more so when it was surrounded by people enjoying each other's company. The table scape faded into the background and the conversation and food shined. I hope your holiday meal was as special.